Bear friend shot in Mendocino County. 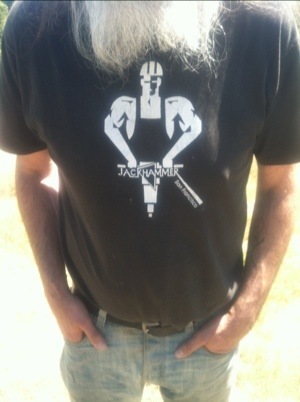 Vintage T-Shirt from the former Jackhammer bar in San Francisco. This entry was posted in ANIMALS: Human and otherwise..., Beards, Collecting, Facial hair, GAY GAZE: Visual Culture, Photos, Art, Comics, Film, Objects, etc..., Human Animals, iPhone, Leather, Men, Mendocino County, Photography, San Francisco, Signage, Subcultures and tagged Bara, Bear, Beard, Gay, Gay Bar, iPhone photography, Jackhammer, Leather, San Francisco. Bookmark the permalink. I have one of those shirts. I inherited it from a friend who died last year. I never actually visited the bar, myself. This one originally belonged to Daddy Alan Selby. I inherited it from him. Fits the bear, so it’s his now. I remember the Jackhammer fondly. I paid tribute to it on Saturday by eating at the sushi bar that occupies its former location.